The Self-Publishing Magazine is a bit different from the other writers’ magazines we have reviewed in that it is designed for a clear group of writers – those who are intending to self-publish their own work. This narrow focus means that it won’t be of much interest to many writers but those who are self-publishing may find it very useful to cover things of concern to them. 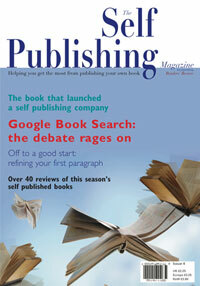 The issue I looked at had a useful article on how to promote your fiction title, with lots of useful tips and another piece entitled ‘Know Your Market’ from a successful small self-publisher. There was also a piece entitled ‘DIY Marketing Non-Fiction’. The emphasis throughout the magazine is on firsthand experience and those who have self-published themselves passing on their tips. A couple of inspirational stories of people who had managed to self-publish their books and how they had done followed, together with a column from a self-publisher. An article on innovation looked at new ways of getting your work into the hands of readers and a piece on Print on Demand described how is it changing the publishing world and offering new opportunities for authors. It’s always useful to be on your guard and one usefully warning article dealt with the dangers of encountering a sham agent and how to recognise them. Finally there’s a useful section of readers’ reviews, offering independent reviews of self-published books.